So you’re interested in the military? First, it’s good to know what options are available to you. You can enlist directly into the military from high school and be an enlisted service-person, or you can go to college and enroll in the Reserve Officers’ Training Corps (ROTC) on your campus (where available) and train to become an officer. The ROTC is a college-based program that trains commissioned officers of the US Armed Forces while those students earn a college degree. 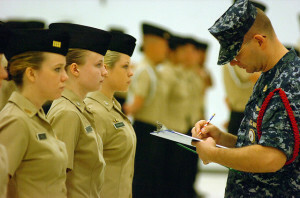 All branches of the US Armed Forces offer ROTC, though the Marine Corps and the Coast Guard do not have their own specific ROTC programs, instead they share programs with the other branches. Almost half of newly commissioned US Army and US Air Force officers went through ROTC programs, and the route is available but less common for Navy and Marine officers. ROTC students can receive an merit-based scholarship (partial or full) for college tuition, and they must remain in good physical and academic standing completely through graduation to retain this scholarship. In return for an ROTC scholarship, a student is obligated to serve an active military service duty after graduation from college. Please note that if you default on this agreement in any way you are held liable to repay the full amount of the scholarship, so be sure to remain in good standing in all ways—including making weight for the routine weight checks. ROTC students who want to go through the entire program and/or receive an ROTC scholarship legally agree to serve as Officers after graduation. Another option is to enroll in the ROTC Basic Course (for only the first two years of college) and this option does not obligate a student to serve unless they have in fact received a scholarship. ROTC students do not go to boot camp like regular enlisted recruits; instead, they learn what it means to be an officer while they attend college. ROTC teaches very valuable leadership and discipline skills, in addition to military training. Many students ask what kinds of scholarships are available and it is great to know that the US Army ROTC, for example, offers 2, 3 and 4 year scholarships, which can pay full tuition and fees, books, and perhaps even a monthly stipend of up to $5,000 per year. It is important to note that ROTC scholarships are not retroactive and that ROTC scholarship stipulations differ from branch to branch, so be sure to carefully check each. For instance, Air Force ROTC students may elect not to continue with the program after their first year of college and they are not held liable to repay the scholarship amount for that year. Getting into your college is still your responsibility and it is separate from the ROTC application process, which is also typically online. It is also good to be aware that if you enroll in a college that shares an ROTC program with another local college or university, it will be your sole responsibility to sort out the timing and the commute. The typical time commitment during the school year is 4-6 hours per week, but this can vary from program to program and even campus to campus somewhat. Students typically choose to major in programs that would benefit a military career, and some branches base a scholarship award amount on the desirability of an applicant’s intended major. Be sure your major is offered by your college and that it is eligible for ROTC funding—and this eligibility can differ from branch to branch! It is good to note that the military gives special consideration to engineering majors, so this is another great reason to consider a career in engineering and computer science. ROTC Scholarship winners agree to serve in active duty for four years; non-scholarship Cadets enrolled in an ROTC Advanced Course agree to serve for three years. Upon graduation and completion of training, graduates become commissioned officers in their branch. US Army Cadets, for example, are commissioned as Second Lieutenants. One of the very best aspects of participating in ROTC, aside from the wildly valuable training and the pride that comes from serving your country, is the exciting fact that upon graduation you have a position waiting for you in one of the world’s leading high technology organizations, the US Military.